the stickiness can be eliminated!! 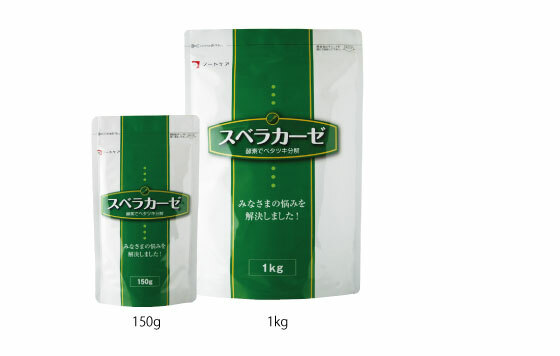 ①Helps eliminate the stickiness in blended porridge or foods rich in starch. ②Dishes will not melt even when placed in food carts set to 65℃; allowing meals to be served hot. ③When eating, the dishes will not be effected by saliva. ④Dishes made with Suberakaze can be frozen for storage. 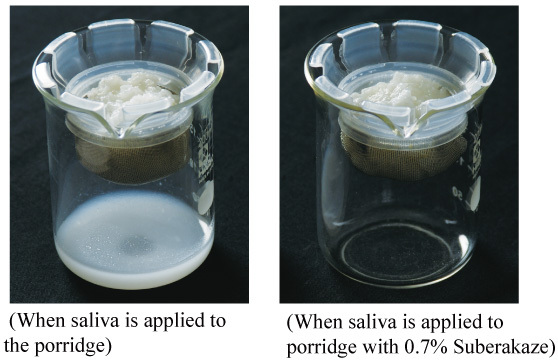 How to make full porridge while preventing saliva from breaking down the rice into water. ① Place 0.7% to 1% of Suberakaze into porridge just cooked and over 70℃. Blend well. ② It will start to solidify while it cools down. ●In order to Suberakaze to dissolve properly, some Suberakaze into 10 to 30ml of hot water and mix into the porridge before blending well. ●For more firm Suberakaze porridge, please add about 2%. ●Make sure that 1% to 2% of the total amount of food and liquid volume is added, and that it reached 70℃ to allow it to dissolve more properly. ●Make sure that Suberakaze is properly dissolved into the food by applying enough heat and mixing well. ●If the porridge does not solidify enough, transfer to a pot and reheating to boiling point. Make sure to stir well at the same time.